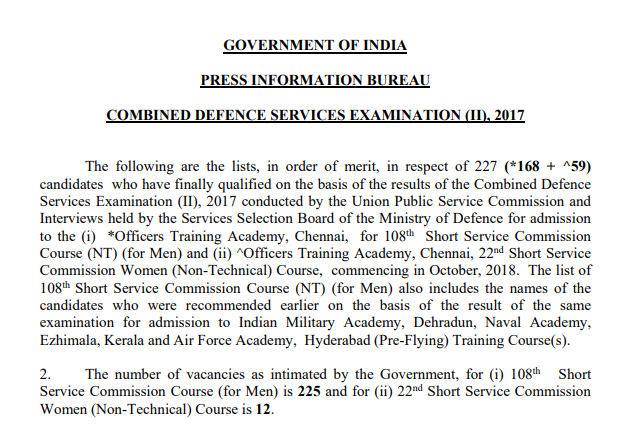 UPSC CDS 2 OTA Final Marks 2017, Result, Merit List, Cut Off – Union Public Service Commission, sole examination conducting body of CDS test, on 31st August 2018 captured the headlines with the latest news that Officer Training Academy i.e. UPSC CDS 2 OTA 2018 Final Marks and UPSC CDS 2 OTA Final Result 2017 can now be checked online on an official website www.upsc.gov.in. Here for final selection procedure, Age group for Officers’ Training Academy is 19-25 years. Whereas, it is 19-24 years, 19-22 years and 19-23 years for Indian Military Academy (IMA), Indian Naval Academy (INA) and Indian Airforce Academy (AFA) respectively. The government of India, Press Information Bureau, Combined Defence Services Examination (II), 2017 has unveiled that candidates can also obtain information regarding results by accessing to UPSC website www.upsc.gov.in. However, marks of the candidates will be available within 15 days from the date of declaration of final results on the commission’s website for 30 days. The attention of the candidates is also invited to the scheme of public disclosure of scores and other details of non-recommended candidates as available in the commission’s website. Such non-recommended candidates may exercise their options while downloading their marks. And, Union Public Service Commission has a facilitation counter near examination hall building in its campus. Candidates may obtain any information/ clarification regarding their examination on working days between 10:00 AM to 05:00 PM, in person or over telephone no. 011-23385271, 011-23381125 and 011-23098543. In IMA list, selected candidates whose names appear in top 10 are Vivek Tharkoti, Debasis Sarangi, Ashish Rai, Manish Rana, Prabhav Rajvanshi, Regatte Sai Kiran Reddy, Paranjape Ashwin Milind, JVM Srikrishna Manikanta Pani, Abhijeet Shivam and Ashish Krishna Kumar.